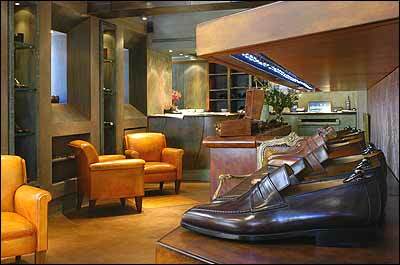 Berluti (971 Madison Ave., nr. 76th St.; 212-439-6400) has evolved from its humble roots (started 110 years ago by an Italian immigrant) to the preferred bespoke shoemaker for aristocrats, dapper entertainers, and well-heeled types who appreciate the quality (it takes an hour of rubbing with essential oils for a cobbler to produce the final color of each shoe). The Venezia ready-to-wear line starts at $900; made-to-order shoes are around $4,300. Designer Minji Kim has opened another Min-K store (219 Mott St., nr. Prince St.; 212-219-2834) for her feminine, vintage-inspired frocks. And on June 10, Clarins is opening a second retail-only store for its plant-based beauty products (247 Columbus Ave., at 71st St.; 212-362-0190).